The BlackBerry KEY2 is an obstinate phone, and one defined by its most retro feature: the keyboard. Just about every design, software, and hardware decision manufacturer TCL has made comes down to the physical keys in some way, whether it’s the form-factor, the size of the touchscreen, or the new “Speed Key” that promises to make navigating Android 8.1 Oreo all the smoother. I’ve been using the KEY2 since last week, so read on for my first look first-impressions. If the KEY2 was an outfit, it would be a Saville Row suit. There’s something resolutely honest about this newest BlackBerry: no notched display to apologize for, and no absent headphone jack to spin “consumers want a slimmer phone” excuses for. Just crisp metal, tactile plastics, and a pleasing sense of familiarity. Part of that is down to the keyboard, of course, which seems designed to tickle the reminiscence lobes in the brain of any phone-user of A Certain Age. It’s not that alone, however. The aluminum frame with its beveled edges feels sturdy and reassuring; the textured back panel has a grippiness that makes you question the glass backs of most mainstream smartphones. Yes, they look shiny and glamorous in photos – and yes, the KEY2 does tend to pick up fingertip grease on its behind – but it’s so aggressively practical that you can’t really fault it. The phone world is a specifications arms race, and one which the KEY2 consciously opts out of. A Snapdragon 660 may not have the bragging rights of Qualcomm’s high-end chips, but I’ve no complaints from the time I’ve already spent with the phone. Hefty webpages have scrolled without lag; my embarrassingly well-stuffed inbox won’t allow me to use smartphone sluggishness as an excuse for late replies. It means I’m not missing wireless charging as much as I thought I might, because the KEY2 has already demonstrated it can go long past a day’s use on a single charge. It’s too early to talk about full battery benchmarks, but just as the KEYone impressed me with its longevity, I’m starting to think the KEY2 will do the same. I suspect the – relatively compact – 4.5-inch display helps there, too. I test a lot of new phones, and few have demanded quite so many permissions be accepted during setup as the KEY2. Blame for that can be laid entirely at the metaphorical feet of the BlackBerry apps, including – but not, I mention, limited to – the BlackBerry Hub, Calendar, Notes, Tasks, Launcher, Password Keeper, and Productivity Tab. Each invariably floats at least one request for data access permissions up for your attention when you first load it, but usually it’s three or four. Certainly, I appreciate Android’s approach to making absolutely sure I know what apps are accessing which of my files, photos, and other data. All the same, I couldn’t help but wish that I could grant blanket permissions to all of the preloaded BlackBerry software that gives the KEY2 its soul, rather than deal with the piecemeal. Muscle-memory. It’s something I remember well from my days of T9 predictive text, punching out SMS messages with naught but a numeric keypad, but as we’ve shifted to virtual interfaces there’s less for my fingers to learn by heart. The KEY2, though, upends that progression. For a start there’s the “Convenience Key” on the right edge of the phone, underneath the volume buttons and the pleasantly knurled power/lock key. It’s designed to act as a shortcut to up to three apps or services: opening the camera, for instance, or switching to the KEY2’s Car profile. If you only set a single shortcut, it’ll trigger that automatically when you press the button; if you have two or three assigned, you’ll get a small menu of the shortcuts to choose between. Easy enough to remember, but things get much more like a memory test when you factor in the so-called “Speed Key” that has replaced the right shift button. It turns every letter on the keyboard into a shortcut: two, actually, since you can have a different trigger depending on whether you long-press the letter or short-press it, while holding the Speed Key down. A long-press on “C” for example might open a new email; short-pressing “I” could open Instagram. Clever stuff, certainly, but it’ll take me some time before I can actually recall what all the shortcuts I’ve set up actually do. The KEY2 bears BlackBerry’s first ever dual camera system, with a pair of 12-megapixel sensors on the back. It follows in the footsteps of the iPhone X, with one of those sensors being paired with a standard lens (in this case f/1.8 aperture) and the other a 2x telephoto (with f/2.6 aperture). The result is an optical zoom and support for things like portrait mode. It may not exactly be a new configuration for the smartphone industry as a whole, but twin cameras at the $649 unlocked price point is still solid. As with battery life, it’s too soon to dig into just how well the KEY2’s photos are shaping up. However, one thing I do like is the ability to save shots to the phone but bypass online backup. You do that by triggering the capture by hitting the space bar – which also integrates the fingerprint sensor – which tells the KEY2 to only save a local copy, not allow your, ahem, exotic photoshoots to escape into the cloud. I’ve had the KEY2 for a little less than a week now, and my experience with the keyboard has been… mixed. On the one hand, the idea of physical keys fills me with tactile joy. In practice, though, there have already been times when I’ve set down the BlackBerry and reached instead for the familiar autocorrection on an iPhone or Pixel 2. Maybe I’m being unfair. 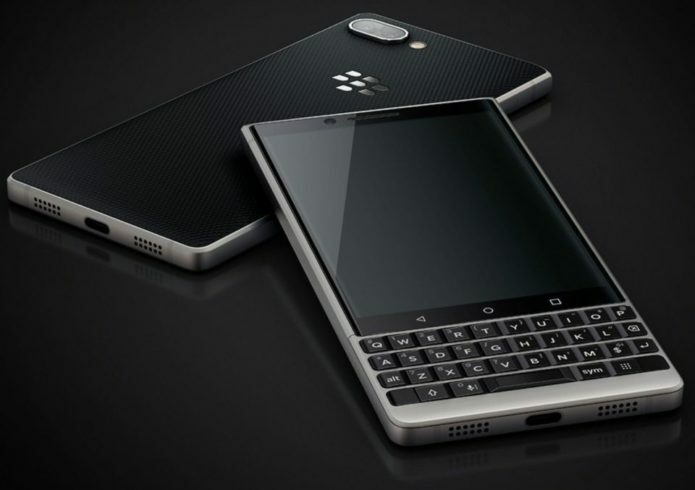 Yet even if the age of hardware QWERTY on smartphones isn’t quite ready to be relegated to the history books, I’m not sure the KEY2 – or, indeed, any portrait aspect smartphone with a physical ‘board – is the right form-factor. The keys are simply too fiddly given the space they have to work with. Now, throw a QWERTY layout on a landscape-orientation design – a slider or a clamshell, I’m not fussy – and that extra space could make typing legitimately easier. The size compromise involved in squeezing a hardware keyboard into the KEY2’s upright chassis, though, is proving to be a struggle for my fingers to get used to. There’s a small, but vocal, cohort of people who still adore physical keyboards on smartphones. Certainly, I enjoyed the KEYone when I reviewed it last year. What qualms I had about it, though, I suspect will be shared by the new KEY2: the flexibility of an on-screen keyboard may well be too far advanced for hardware keys to catch up. BlackBerry, though, is convinced the KEY2 will make me think differently. Certainly there are some good reasons to slot this retro slab into my pocket. Whether I’ll have decided to do that after some serious keyboard use, you’ll have to wait for our full review to find out.